If you are like most of our patients, the lingering numbness of anesthesia after a dental procedure is not something you enjoy. Many patients take unnecessary time off of work because they do not want to return to their workplace while they are still numb from a dental appointment. With Oraverse, you no longer have to worry about taking the rest of the day off. OraVerse is the first and only product of its kind with the ability to rapidly reverse the effects of your local dental anesthetic so you can feel, speak, smile, and drink normally in approximately half the time. 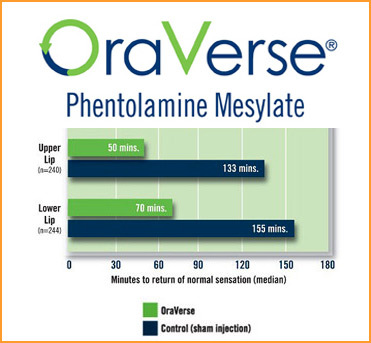 Oraverse has been scientifically proven to accelerate the return of normal sensation and function following routine dental procedures in children, adolescents, and adults. We are excited to offer this new and innovative product to our patients for a nominal fee.